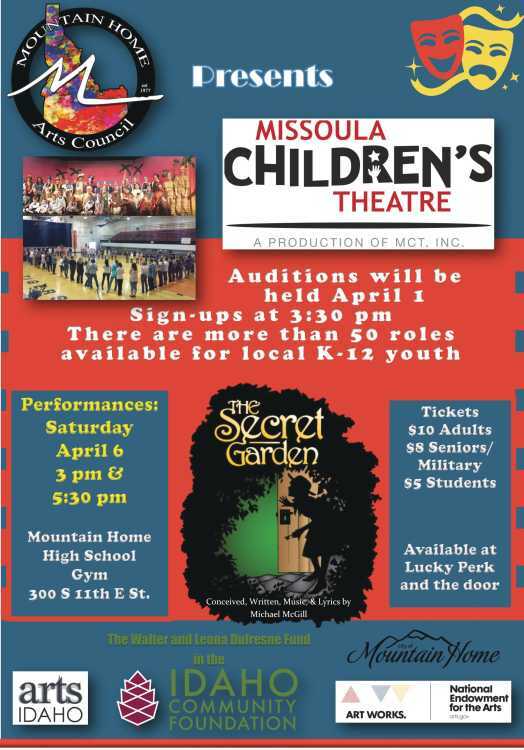 The Mountain Home Arts Council is proud to bring you Missoula Children’s Theatre production of The Secret Garden. Auditions will be held Monday, April 1, at the Mountain Home High School’s Lloyd Schiller Gym, 300 South 11th East Street, Mountain Home, ID. Sign-ups are at 3:30 pm, and auditions begin promptly at 4 pm. Approximately 50-60 local K-12 students will be cast to appear in the show with the MCT Tour Actor/Directors. There is no guarantee that everyone who auditions will be cast in the play. Those students cast for roles will be asked to pay a nominal $20 fee for the week-long residency. Families with multiple children will be given a $5 discount per additional child. If this is a hardship, please contact the Mountain Home Arts Council. Students wishing to audition must arrive by the scheduled starting time and stay for the entire two-hour session. The first rehearsal begins approximately 15-minutes after the audition. This is a group audition–no advance preparation is necessary, but a smile never hurts. Students should just be ready to come and have a good time! The performances will take place at 3:00 pm and 5:30 pm on Saturday, April 6, at the Mountain Home High School Gym. Tickets are $10.00 for adults, $8.00 Seniors/Military and $5.00 for Students, available in advance at Lucky Perk and at the door. Rehearsals will be conducted every day from 3:45 pm to 8 pm at the MHHS Gym. Although not all cast members will be needed at every session, those auditioning must have a clear schedule for the entire week; and if selected, be able to attend all rehearsals required for their role and be available for all scheduled performances. A detailed rehearsal schedule will be distributed at the conclusion of the audition. Cast members scheduled for the full 4 hours and 15 minutes will be asked to bring a sack dinner to be eaten between sessions. Among the roles to be cast are Mary Lennox, Martha Sowerby, Dickon Sowerby, Susan Sowerby, Colin Craven, Archibald Craven, Ayah, Mrs. Medlock, Doctor Craven, Ben Weatherstaff, Robin Redbreast, the Bugs that Rock, the Canadian Geese, the Moor Folk, the Fireflies, the Secret Garden, and Assistant Directors.